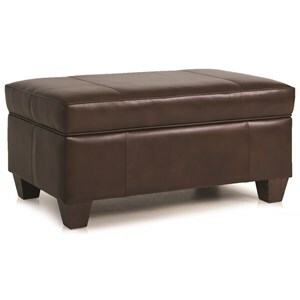 This ottoman is a great piece for your living room. Featuring a casual design style with stabilizing horizontal lines and a plush top, this upholstered ottoman makes an ideal addition to any living room or other seating area. Lift up the top and store blankets, pillows, books and more inside this storage piece. 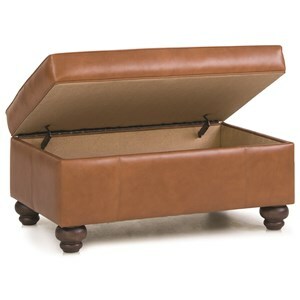 This ottoman has a skirt as the base and hidden casters underneath, making it easy to move around the room. Available in a wide selection of leathers and fabrics, this piece allows you to select the look that's right for your home. See store for details. 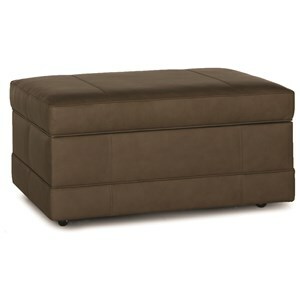 The 900 Storage Ottoman with Skirt and Hidden Casters by Smith Brothers at Wayside Furniture in the Akron, Cleveland, Canton, Medina, Youngstown, Ohio area. Product availability may vary. Contact us for the most current availability on this product. The 900 collection is a great option if you are looking for furniture in the Akron, Cleveland, Canton, Medina, Youngstown, Ohio area. Browse other items in the 900 collection from Wayside Furniture in the Akron, Cleveland, Canton, Medina, Youngstown, Ohio area.